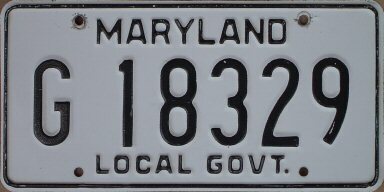 This page presents information about and photos of Maryland license plates with manufacturing errors, die variations, low numbers, and other interesting features. 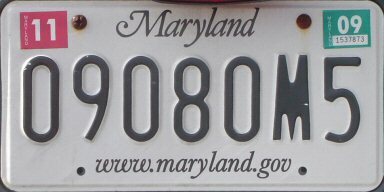 February 21, 2019 – Added a 1980 truck plate with multiple errors. Upgraded my 1975 version 1 (old dies) plate. 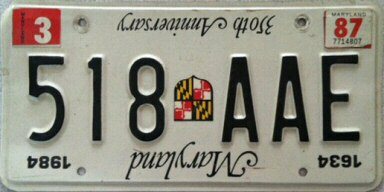 January 21, 2019 – Replaced the photo of someone else's 1982 historic motorcycle plate with upside-down bolt holes with that of one I've added to my collection. 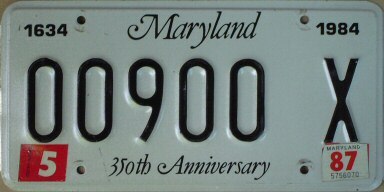 September 8, 2018 – Replaced the photo of a 900-series MPV plate stamped with New Jersey dies. Minor text updates. 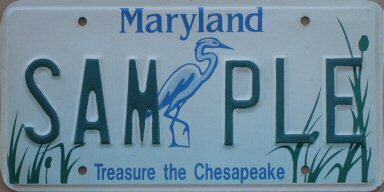 Ever since I created this web site in 2004, I've had people e-mail me photos of interesting Maryland plates to add to the site. In some cases, I really didn't have a suitable place on the site to display what they had sent. On this page I display various error plates and low-numbered plates, which rectifies most of that problem. I also show die and bolt hole variations, which I've consolidated from several other pages on this site. I expect that I will occasionally add new topics to this page. 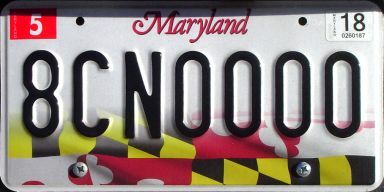 Like every other jurisdiction that produces license plates, Maryland produces its share of error plates. Probably most of these never see the light of day. Some, however, have been issued and used, and others, although intercepted before being actually issued, were not destroyed and have found their way into the hands of collectors. I've grouped some of the more common types of errors together, below. Several examples of W / M inversion errors. 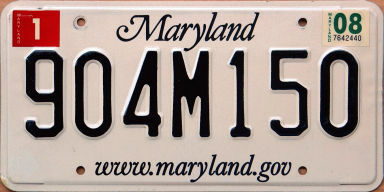 Both the 1991 and 1995 passenger car plates have a "W" made with an upside-down "M" die. 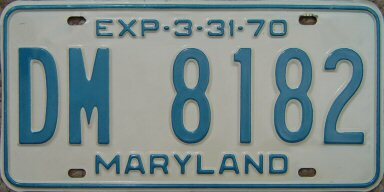 (The 1991 plate also has a normal "W".) 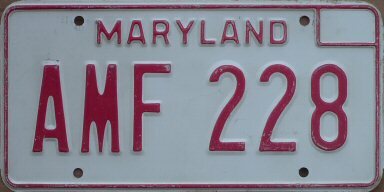 On the undated (1976) red-on-white passenger car plate, the Treasure the Chesapeake sample plate and the 2009 multi-purpose vehicle plate (plate in actual use), the "M" was stamped with an upside-down "W" die. "W / M invert" plates are those where the letter "M" has been stamped using an upside-down "W" die, or vice-versa. Sometimes these are referred to as "William and Mary" error plates. 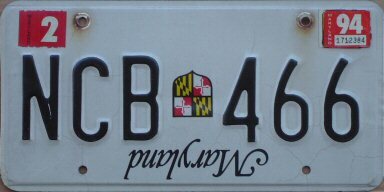 This is probably the most common kind of Maryland error plate. "M" dies have legs that are completely vertical, while the legs on an upside-down "W" are wider at the bottom than at the top. 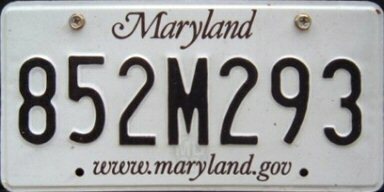 A good number of red-on-white 1976-1980 passenger car plates had the letter "M" made from an upside-down "W" die. Every one of these I've seen was in the AMx series or in one of several AxM series. However, I know that not all AxM series plates were made this way. 1987 350th Anniversary optional passenger car full invert (Power photo and plate); 1994 passenger car full invert; current truck full invert (Ellis photo of plate in use). "Serial invert" plates have the entire plate number stamped upside-down on the plate, or more accurately, were stamped with the blank plate inserted upside-down into the stamping machine. Not many of these were actually issued and used, but those that were are quite striking in appearance. 1976 U.S. 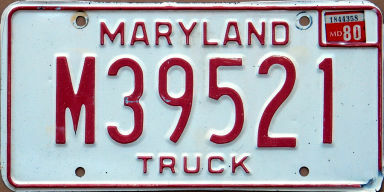 Senator plate stamped with a plate number likely for a state senator (Sells photo and plate); 1980 truck plate with no space separator and a "2" larger than other characters; 1982 historic motorcycle plate with misplaced bolt holes; 1990s State Police Motor Carrier Safety Assistance Program (MCSAP) plate with a misspelled acronym (Olivarri plate); 2012 Treasure the Cheaspeake specialty passenger car plate with die misalignment (Ellis photo of plate in use). 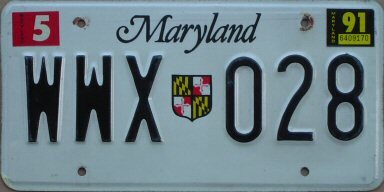 The plates shown above are representative of various other kinds of license plate manufacturing errors. Some of these errors are not obvious from the photos and require elaboration. The U.S. Senate plate has an incorrect plate number for that plate type. 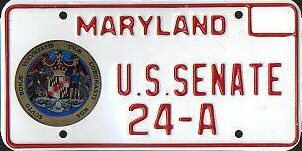 There are only two U.S. senators from Maryland (or any other state), and so the number on the plate should not be greater than 2. Most likely this was supposed to be a state senator plate. 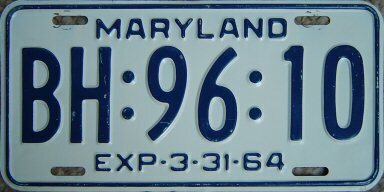 State senator plates say "Senate" on them rather than "U.S. Senate". The 1980 truck plate is a mess. I count three different errors on this plate. There's supposed to be a space separator between the letter and the numbers. The "2" in the plate number was stamped with a 1957-74 die and is noticeably larger than the other characters. And last, the raised border isn't raised at the lower right corner of the plate; the plate had to have been made this way since there's no red paint in that corner. The historic motorcycle plate has the bolt holes upside down from where they should be. On motorcycle plates issued between 1971 and 2008, there should be oval-shaped bolt holes at the top corners and round bolt holes at the bottom, away from the corners. On every low-numered 1981-base historic motorcycle plate I've seen, the bolt holes were punched upside-down relative to where they should be on the plate. This puts the oval-shaped bolt holes in the bottom corners of the plate, where they interfere with the year sticker (and starting in 1986, also the month sticker). 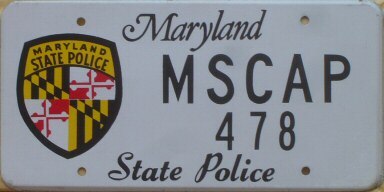 The State Police plate is supposed to be for the Motor Carrier Safety Assistance Program, which has an acronym of "MCSAP". Instead, the plate says "MSCAP". 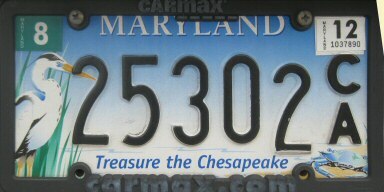 The error on the Treasure the Chesapeake should be obvious; the fifth digit of the plate number was stamped too low on the plate due to a misaligned die. 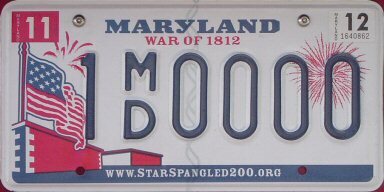 There are many instances of die variations (and, to a lesser extent, bolt hole variations) during the history of Maryland license plates. I'm not going to attempt to document every one of these, but rather am going to just give you some of the highlights. 1964 expiration passenger car plates with old and new bolt holes; 1970 expiration passenger car plates with old and new bolt holes. 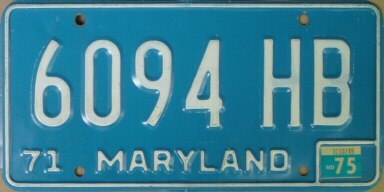 Late in the life of the 1964 expiration plate, starting at about the FN series of passenger car plates, the size of the bolt holes was reduced from a long oval to a short oval. 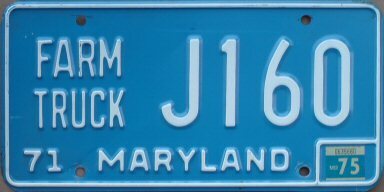 Late in the life of the 1970 expiration plate, starting at about the JA series of passenger car plates, the bolt holes were again reduced from a short oval to a circle. 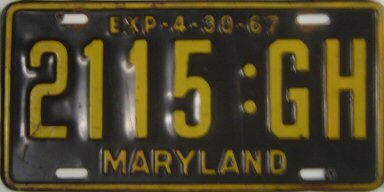 1967 passenger car plate with normal dies; 1967 motorcycle plate with normal dies (Sallmen photo / plate); 1967 expiration trailer and motorcycle plates with strange dies (both Francis plates). This is a new one on me. I've never seen or heard of 1967 die variations until I saw these two plates in Jeff Francis' display room in January 2014. My first guess is that they were prototypes of some kind, as Jeff is a very experienced collector who would not be easily fooled by fakes. However, both plates show evidence of use. 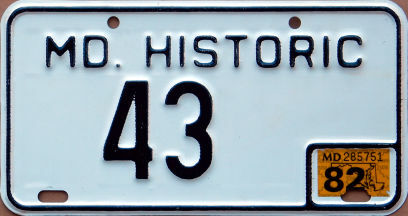 Possibly this was a similar situation to the New Jersey die plates shown below, where the state plate shop was out of commission and another state or a private company was temporarily used to make plates. 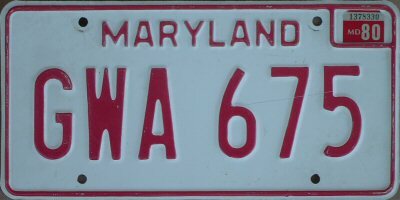 These 1967 plates were not made by New Jersey, however, nor do I recognize the dies as being those of any other state. One fellow collector suggested that the dies are similar to Montgomery County incinerator and landfill permit plates, which are apparently made by a private company. I agree they're similar, but I don't think they're the same, so the question of who made these plates is still open. 1971 base passenger car plates with old and new dies; trailer plates with old and new dies; farm truck plates with old and new dies. Late in the life of the dated 1971 base, in mid-year 1974, new serial dies were put into production, and newly-made plates had serial characters that were slightly smaller and letters that were more squared-off than previously. Plates made with both the old and new dies had natural 1975 expirations, but no plates with the new dies had expirations prior to 1975. I don't believe all plate types were made with the new dies, but several of them were, as shown above. 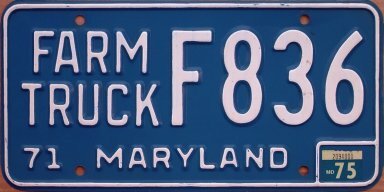 In addition to the serial die variations, the farm truck plates had plate type die variations. 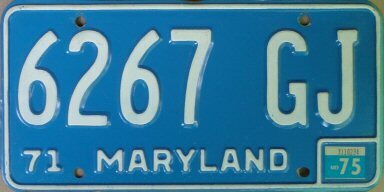 1976 base passenger car plates with painted and unpainted sticker box borders. 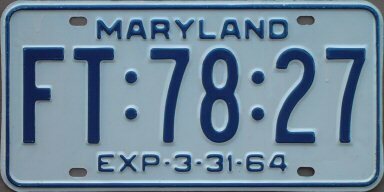 1981 base local governemnt vehicle plates without and with sticker boxes. 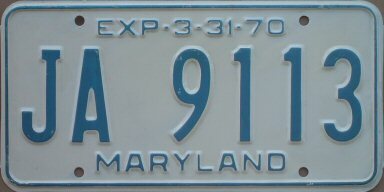 1981 base passenger car plates, and 1981 base local government vehicle plates, each with normal and wide space separators. 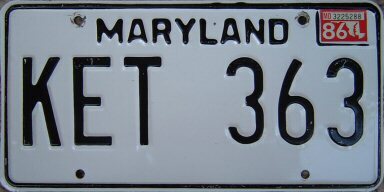 Late in the life of the undated black-on-white 1981 base, in late 1985, the space separator between the plate letters and numbers became wider, pushing the serial number characters towards the side edges of the plates. 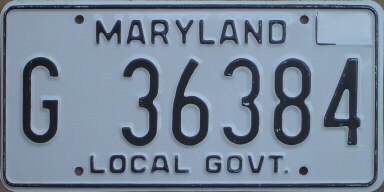 This variation has been seen on both passenger car plates and local government vehicle plates. 350th anniversary multipurpose vehicle plates with and without serial space separators. 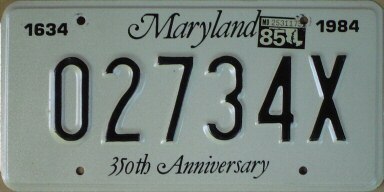 Maryland 350th anniversary special interest plates were available to both passenger cars and multipurpose passenger vehicles (MPVs; passenger vans, SUVs, and motor homes, mostly). MPV plates weren't nearly as popular as the car plates, perhaps because they didn't have the shield emblem on them. The serial format for the MPV plates was 00000 X, but for unknown reasons, later issues lost the space separator and thus were in format 00000X. My guess is that they removed the space to avoid complaints that the shield was "missing". Two passenger plates and two multipurpose vehicle (MPV) plates made with square New Jersey dies (December 2008 expiration plates in actual use). 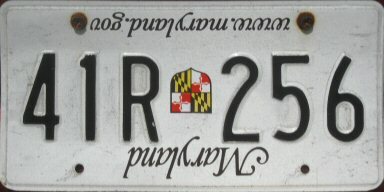 Plates with strange looking, squared-off serial characters were issued over the course of a few months in the fall of 2006 and into early 2007. Passenger car plates with serials in the range 1CN*A01 to 9CN*Z99, and multipurpose vehicle plates with serials between 895M001 and 909M999 were made this way. 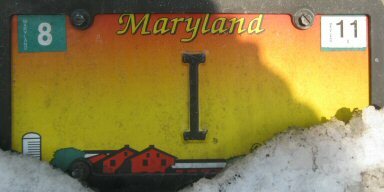 The Maryland license plate facility at the state prison in Jessup was shut down for about three weeks due to inmate unrest, and Maryland arranged for New Jersey to stamp out plates for them in the interim. 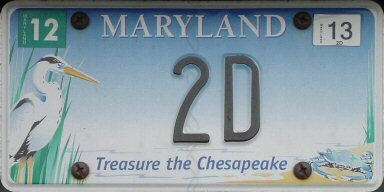 New Jersey could not or would not use Maryland's serial dies, and instead made the plates using their own dies. The state seems to have one number "2" die that doesn't quite match the others. 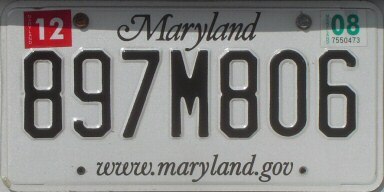 It's not so different as to really stand out on a plate with a single number "2", but it can be seen on plate number 852M293 above by closely comparing the two number "2"s in the serial. The first "2" was stamped with the odd die, while the second "2" was stamped using the normal die. (Click the photo to see a larger version.) 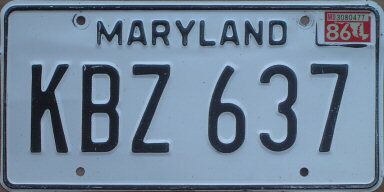 According to Maryland plate spotter Jeff Ellis, this odd die has shown up on MPV plates in the 852M000, 862M000, and 872M000 ranges, and also on state government plates in the S/G*24000 series, the A172000 series of Our Farms, Our Future special interest plates, as well as some occasional Treasure the Chesapeake special interest plates and vanities. No, these aren't errors, but you could consider them oddities, I suppose. 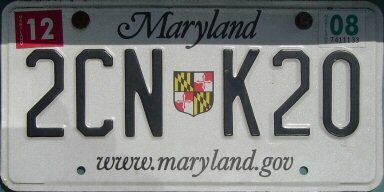 In any case, in this section are some unusual and interesting Maryland license plates. 1952 bus plate numbers "1", "2", and "3" (Olivarri photos and plates). 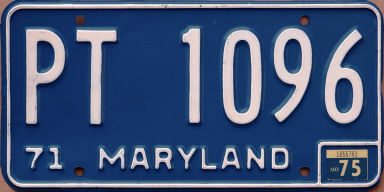 Between sometime in the 1920s (or even earlier) and 1953, buses were assigned plate numbers between 1 and 1000 or thereabouts, and in many cases did not have any words or prefix or suffix letters indicating the plate type. The 1952 expiration plates shown above would seem to be ordinary bus plates with very low numbers. 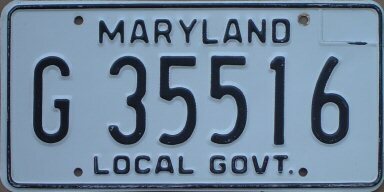 They're clearly not plates issued to the governor and his cronies for their passenger cars, as the April expiraion month was only used on plate types other than passenger cars and motorcycles. 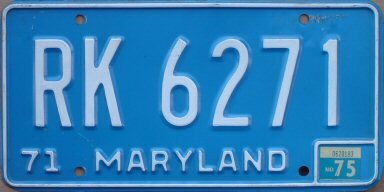 Possibly the lowest-numbered 1952 passenger car plate (YOM plate in actual use). 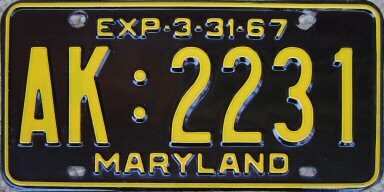 Between 1921 and 1953, Maryland passenger car plate numbers began at either 30-000 or 30-001. I've never been clear on which it actualy was. Every instance of sample plates from that period that I've seen had plate number 00-000, including the March 1952 base. 1952 expiration plates were the first to indicate different expiration months for non-passenger plates (numbered 1 to 29-999 and 800-000 and above) and passenger car plates (numbered 30-000? to 799-999). 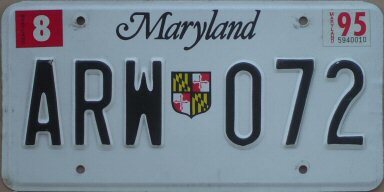 However, besides the plate shown above and its mate, I've also seen one other Maryland plate with number 30-000. It was from an earlier year, but I can't remember specifically which one. So, I don't know what to make of this plate. 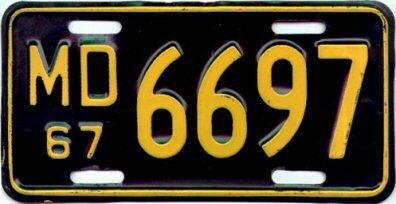 Either it's in fact the lowest-numbered 1952 passenger car plate, or it's a specifically a passenger car sample (rather than a generic sample), depicting a fictitious plate number similar to later passenger samples numbered AA-0000. In any case, it's an interesting plate. 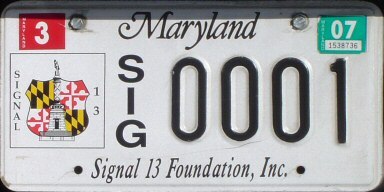 Lowest-numbered Signal 13 Foundation organizational member plate (plate in actual use); lowest-numbered War of 1812 passenger car plate (plate in actual use). 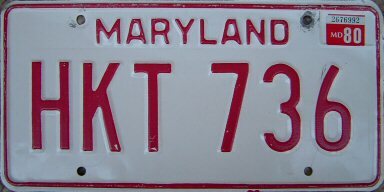 There are many hundreds of various Maryland organizational member plate types; each has its own unique prefix letters and the plate numbering starts at 0001. Many of these plate types have had few plates issued, so it's not terribly hard to find a plate number 0001 in use. 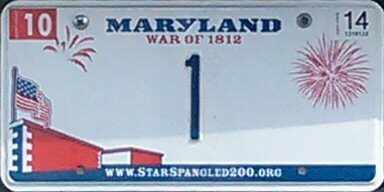 The War of 1812 and "Maryland Proud" (state flag at the bottom) passenger car plates shown above are the very first sequentially-numbered plates made on those respective bases. On the War of 1812 base, the "M/D" was series was issued first, before the letters advanced alphabetically from "A/A" forward, and the digit to the left of the letters is never a zero. 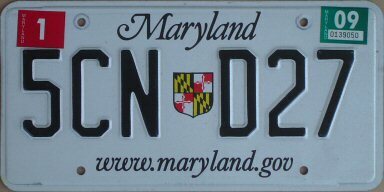 On the "Maryland Proud" base, numbering began after the highest War of 1812 plate made, at 8CN0000. Vanity plate "1" (Leu photo of plate in use); vanity plate "I" (Ellis photo of plate in use); vanity plate "2D" (plate in use). These look like low-numbered plates, but as far as I know, they're all ordinary vanity plates that anyone could have obtained had they been first to request them. Since they were made on request and not sequentially, technically, they're not low-numbered. More accurately, they have short plate numbers. Or letters, as the case may be. Thanks to those who have directly contributed to the information on this page: Jeff Ellis, Dirk Leu, Jon Olivarri, Barry Power, and Joe Sallmen. Ellis, Leu, Olivarri, Power, Sells, and Sallmen photographs are presumed to be copyrighted by Jeff Ellis, Dirk Leu, Jon Olivarri, Barry Power, Mike Sells, and Joe Sallmen, respectively, and are used with permission. Olivarri and Francis plates are from the collection of Jon Olivarri and Jeff Francis, respectively. All text and photographs © copyright 2004-2015, 2018, 2019 by Rick Kretschmer, except where noted. All rights reserved.